Appartamento Gemma, 4-room apartment 70 m2 on 2nd floor. Spacious and bright, comfortable and cosy furnishings: living room with 1 sofabed (140 cm, length 180 cm), cable TV, flat screen, radio, CD-player and hi-fi system. 1 double bedroom with 1 double bed (1 x 160 cm, length 200 cm). 2 rooms, each room with 1 bed (90 cm, length 200 cm). Kitchen-/living room (4 hot plates, oven, dishwasher, microwave, electric coffee machine, Capsules for coffee machine (Nespresso) extra, raclette grill fondue Set (cheese)) with dining table. Exit to the balcony. Hip bath/WC. Electric heating. Small balcony. Balcony furniture, barbecue. View of the mountains and the countryside. Facilities: children's high chair, baby cot for up to 3 year olds (extra), hair dryer. Please note: non-smokers only. Smoke alarm. 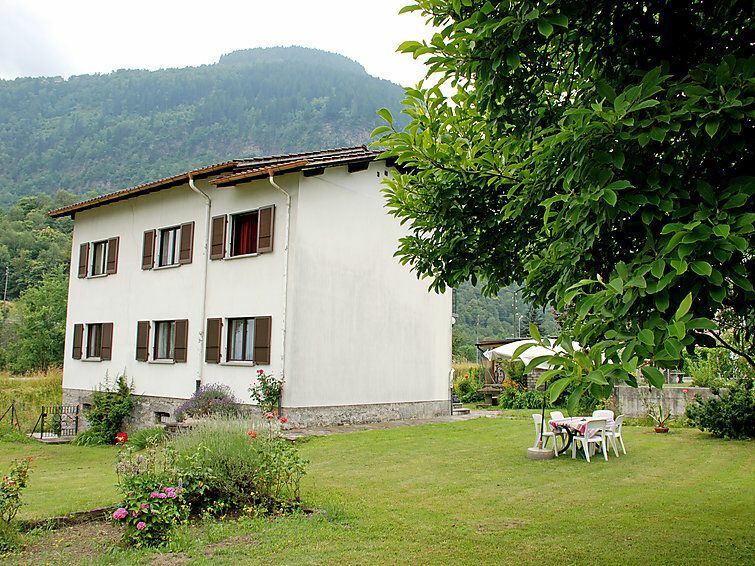 Chironico 10 km from Faido: Comfortable 2-family house Appartamento Gemma, 790 m a.s.l., detached, surrounded by trees. In the resort 300 m from the centre of Chironico, in the district Leventina, in a quiet, sunny position, 500 m from the edge of the forest, in a cul-de-sac. For shared use: beautiful, well-kept garden 120 m2 with lawn, parking (for 2 cars) at the house. Shop 300 m, supermarket 10 km, restaurant 1 km, 10 minute walk to the centre, bus stop Bus 123 Chironico 800 m, railway station Faido SBB - CFF 10.5 km. Walking paths from the house 50 m, cable car 28 km, slopes 28 km, children's playground 30 m. Nearby attractions: Boulder area 70 m, Castelli di Bellinzona, Unesco, Chiesa di San Nicolao Giornico, Caseificio del Gottardo, Lugano, Locarno. Well-known ski regions can easily be reached: Airolo, Dalpe, Cari, Prato, Valle Bedretto. Well-known lakes can easily be reached: Lago Tremorgio, Lago Ritóm, Lago di Cavagnöö, Lago Retico, Lago Maggiore, Lago di Lugano. Hiking paths: Strada Alta, Val Piora, Valle Bedretto, Prato, Valle di Blenio. Please note: baby equipment on request (extra).